Every company brings its own very individual culture. This will strongly dependent on the line of business, the history (including mergers and acquisition) of the company and the local employee base. The organizational structure will not only determine how a company is being perceived by the customers, suppliers or potential employees, it will also influence the delivery of services and products. It is therefore a critical aspect to work upon, to achieve strategic change. 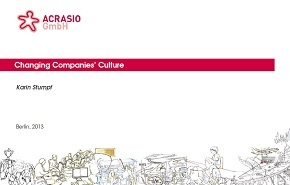 Download Presentation on Changing Companies Culture (pdf).